In large skillet heat 1 Tbsp. of the olive oil over medium heat. Lightly sprinkle chicken tenders with salt and pepper. Cook chicken in hot oil for 8 to 10 minutes, turning once, until no pink remains. For vinaigrette, in a screw-top jar combine remaining oil, vinegar, thyme, sugar, and 1/4 teaspoon each salt and pepper; shake to combine. 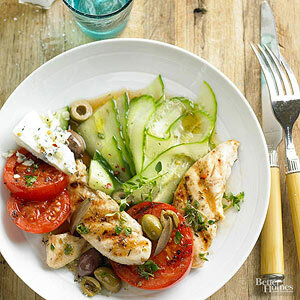 On four dinner plates arrange chicken, cucumber ribbons, sliced tomatoes, olives, and feta cheese. Drizzle vinaigrette over salads. Substitute fish for chicken, zucchini or carrots for cucumbers, halved cherry or grape tomatoes for sliced tomatoes, and pitted Kalamata or ripe olives for the olives.